This is a sumptuous Grilled Lemongrass Shrimps Salad, pack with nutrients. If weather permits, then go ahead and grill the shrimps outdoor. Otherwise, pan grilled taste fantastic too. Grilled Lemongrass Shrimps: In a large bowl, mix the shrimps with garlic, scallions, sugar, sea salt, black pepper, lemongrass, and peanut oil. Marinate the shrimps for about 20 minutes. Heat the grill on high and grill the shrimps for about 2 to 3 minutes per side. 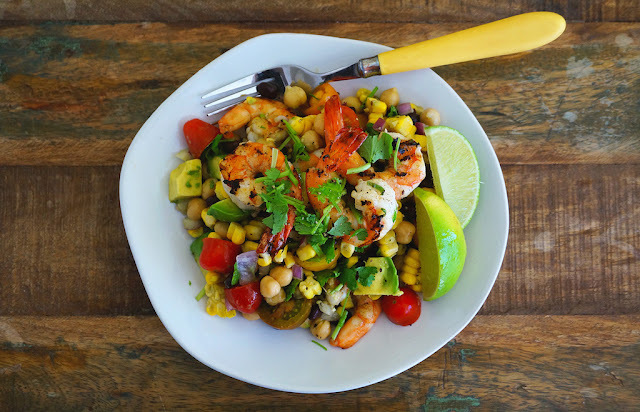 Salad: In a large bowl, combine corn kernels, black beans, chickpeas, tomatoes, onion, avocado, ground cumin, coriander, lime juice, sea salt, 1/2 portions of the grilled shrimps. Toss until well combined. To serve: Place a portion of the salad in a serving plate or bowl and top with few grilled shrimps, and season with sea salt, pepper & lime wedges.